Hello home health OTs! Aren’t we lucky? We get to work with clients in their most natural context; in the home or in the community. However, there is a downside; sitting in our cars for long periods of time as we go from session to session. When sitting in a car, our upper body and low back round forward and our legs are kept in a flexed position that doesn’t really change. This posture causes tight chest and weak back muscles as well as tight hip flexors and hamstrings. These muscular imbalances often lead to low back pain as well as general pain in the muscles affected. 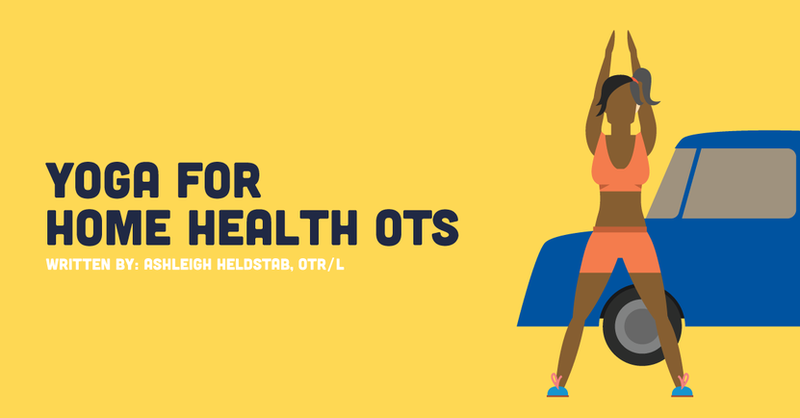 As OTs we know the impact that muscular imbalances and pain can have on participation in daily life, and we also know the importance of self-care, so we want to do something to counteract the effects of sitting in a car for so long. One way we can address these issues is through yoga. And the good news is, you don’t have to commit to taking a full class multiple times a week! Just using a couple poses daily (or at least on the days you work) can be beneficial. I have broken this practice down into two sets. The first set of poses is to be done while in your car; these I recommend doing between each session or whenever you’re starting to feel some discomfort. The second set of poses is to be done at the end of the day, when you’re at home. These poses you only need to do once or twice in the evening after a day at work. Make these poses a habit and in no time, you’ll be feeling great! Please, don’t try this while you’re driving! Seated Spinal Twist – This one is my absolute favorite. This pose is going to stretch your spine in a direction it doesn’t really get to move while you’re driving as well as build core strength, which helps to prevent low back pain. Sitting tall in your seat, inhale deeply. As you exhale, twist to your right (towards the passenger side of your car) using your core muscles. Then let your left hand rest on your right knee and your right hand rest on the center console. Maintain this twist for 3-5 deep breaths. Repeat on the other side, allowing your left hand to rest on the door of your car. Seated Cat-Cow – This pose is going to move the spine, and chest and back muscles through both a stretch and strengthening sequence to counteract muscular imbalances. Again, sit nice and tall, really try to lengthen your spine. Place your hands on your knees and as you inhale, draw your shoulder blades together behind you and lift your sternum up towards the windshield. You can either bring your chin toward your chest here or you can lift your gaze toward the ceiling. As you exhale, push your shoulder blades forward, round your upper back, and draw your chin towards your chest and gaze towards your lap. (Note: You can also clasp your hands and push forward through the palms, whichever you prefer). Continue moving through these two poses with your breath for 5-10 rounds. Neck Rolls – Time to stretch out those neck muscles. Sit tall (did you see that coming?) in your seat and gently drop your chin down toward your chest so that your nose is pointing at your lap. Take a deep breath here. On your next inhale, begin to draw your nose to one side and then raise it toward the roof of your car. As you exhale, begin to draw your nose to the opposite side and back down toward your lap. Really try to reach that nose as far as you can in each direction. Try to keep this movement fluid with your breath and continue with 3-5 circles in one direction before switching to move in the opposite direction. You can do these all at once or throughout your evening. Camel – I usually do this one as soon as I’ve put my bags down. Stand tall, create a fist with each hand and place them on the low back on each side of the spine (note: you can also place your palms in the same location with fingers pointing down). Begin to draw the shoulder blades and elbows together behind you. As you inhale, lift from the rib cage and as you exhale, open your heart toward the top of your wall. Here, just as with Cat-Cow above, you can choose to keep your chin at your chest or you can lift your gaze toward the ceiling. If you lift your gaze, keep your neck strong to prevent your head from falling back — you know as an OT that is not good. Hold this pose while take 5-7 breaths. This pose is really going to work to stretch the muscles on the front side of the body while strengthening strengthen back and core muscles. Warrior I – Standing tall, take a big step back with your right foot, you want a distance of about 4-6 feet between your feet. Bring your back heel to the floor at about a 45 degree angle. Inhale your arms overhead then draw your elbows down to the side, at about 90 degrees. From this position, gently begin to draw the elbows back (they won’t go far, but you’re strengthening your traps and opening your chest by doing this). Allow your hips to open a little bit, but you’re gently trying to draw your right hip forward and your left hip back to get a great stretch on those hip flexor muscles (Hint: Illiacus and Psoas). Take 5-7 deep breaths then switch sides! Forward Fold – This pose can be done standing or seated. If you’re standing, I recommend doing it against a wall. I like to do one of each myself. If standing, place your back against the wall and let the upper body slowly sink down toward the floor. Have as much of a bend in the knees as you need, especially if you’re feeling some discomfort in the low back. Grab opposite elbows if it’s comfortable, otherwise hold onto the floor or your shins. You can gently rock side to side if you want. If you’re doing this pose while seated, sit nice and tall on the floor, bend your knees as much as you need so that your tailbone is not rolling under. Inhale and try to lengthen the spine. As you exhale, let the upper body glide forward over the legs. Relax the shoulders and let the head hang. Hold for 5-10 breaths in either variation!